While working at JoyTunes on the latest versions of our top-notch piano app, we've done a great deal of UI redesign and therefore had to spend long hours with the notorious Interface Builder, resizing images and views, which can be a lot of frustrating work. During this work, we actually discovered a great deal of neat IB tricks, and I decided I must share them with the world. So I conducted this little post of my 8 greatest tips for working effectively with IB. In JoyTunes, we work with .xib files (not storyboards), and without Auto Layout. This is mostly for historical reasons. As a result, some of the tips I'm mentioning might react a little differently for you if you're using storyboards or Auto Layout, but most should apply just the same. I'm so ashamed I only took the effort to look this up only recently. A HUGE time saver. A parent container view to fit the frames of its subviews. Do you know that annoying feeling when you have some subviews all located and then you decide they need to have a different parent view, or even a different .xib, and then they are all automatically get located in the center of the new view? When trying to add padding to a view, the x's and y's of the subview is retained, which isn't always what you want. One thing that bugs me when working with IB, is the inability to move views that aren't in front easily. One way to do so will be to temporary bring it to front and then bring it back, but this is annoying. Another way will be to use the size inspector on the right panel, which is fine but could take some guessing and adjustments until you get it right. 1. Choose the view on the document outline. 2. Click on the frame of the root view in order to gain focus. 3. Move with arrow keys. If you double-click a view in the outline, it will switch focus to the layout pane with that view selected. Shift+Right(Ctrl) Click over the view in IB and you'll see a menu of all the views that exist where you've clicked. Often, the order of IBOutletColletions is important to us, and we want to iterate on them in code in that order. One way of doing it is sorting them in code by their x/y/tag, and then iterate. As you can probably guess, we defined a JTLabel class that you can set stroke color and width to, and this is our way of immediately setting this without having to write any code. Another common hack that can be applied this way is setting "layer.cornerRadius" of any view, to make it have rounded corners. A relevant tool that uses this mechanism is Canvas, which will let you define animations for views without writing code. In your implementation class you cannot use initWithCoder: otherwise your key-value path setting will not be picked up. You will have to do all your implementation within awakeFromNib. 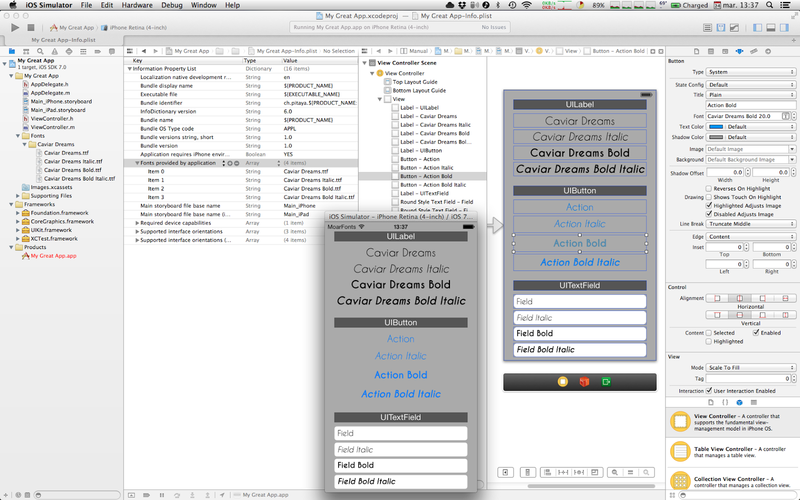 Custom fonts have always been a big issue when working with Interface Builder. There's no built-in support for those, and the best solutions I have seen were either using custom properties solutions like Canvas, or using font replacing techniques like IBCustomFonts. These are valid solutions, but they have a great downside - they don't give you a full WYSIWYG experience, which is exactly why you are using Interface Builder in the first place. It can be very annoying to place a label with a placeholder font and then having to run the app in order to discover that the width you gave it doesn't fit well with your replacing custom font. Lately I stumbled upon this solution called MoarFonts. It costs 10$, and there's no demo or trial - but trust me, it's totally worth it! I hope at least some of the tips were something you didn't know. If you have any other tips you think I should add to the list, or if you have a better way to achieve some of the stuff I was trying to solve, please send me a tweet (@theyonibomber). Also, you should listen to my podcast about mobile development & beer (in Hebrew). Very cool post, other than one tip, i don't know anything until now. Thank you very much! Good tips. Another tip useful for #5: If you double-click a view in the outline, it will switch focus to the layout pane with that view selected. There is a better way to achieve #5 though - Shift+Right(Ctrl) Click over the view in IB and you'll see a menu of all the views that exist where you've clicked. Select the one you want from the list, and you can then use the arrow keys to move it. Thanks! It does seem like a better way. Edited the tip. Thank you! I don't know IBOutletColletions before reading this post. Thank you for the great tips...!!! I wish I stumbled on to your #3 point "Embed in View > Unembed" a while back. It was a pain to get all those elements back in their position across 5 different views. Most of these are fantastic tips and shown with a nicer gif than a simple screenshot. Kudos! Thank you for the great post, it's very useful!! Have noticed an anoying thing. When draging out a new image from bottom right collection of assets, the size of the UIImageView gets doubled. I have to manually resize every image I drag in. Good tips. We need more posts like this to know about the "tricks" there is from Xcode IB. These are some helpful home improvement & computer tips. Thanks for the share! This blog explains the details of most popular technological details. This helps to learn about what are all the different method is there. And the working methods all of that are explained here. Informative blog.For more info visit our website.